*Fits Grace Frames Pinnacle, GMQ Pro and Little Gracie II. Will not work with older models Grace Frames GMQ and Little Gracie, without the Pro and II suffix in model number. Works on new model Continuum and GQ frames. 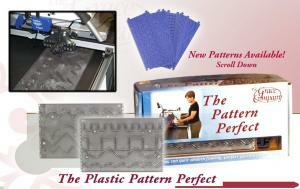 For perfect patterns every time, use the Plastic Pattern Perfect! The stylus attaches right to your carriage and then guides you machine through the pattern templates as you push the carriage. Each basic set template is double-sided and has eight patterns. The Basic Plastic Pattern Perfect Set comes with the stylus and all hardware needed to use the Basic Set or Additional templates. The Grace Pattern Perfect- Plastic Edition adapts onto the tabletop of your GMQ-Pro, Little Gracie II, or Pinnacle Machine Quilting Frames. Combine and repeat patterns in interesting ways to create unique designs on your quilt. The Grace Pattern Perfect—An exciting new way to quilt perfect patterns with ease! The Grace Pattern Perfect adapts onto the carriage assembly and table top of your Grace Machine Quilter. The stylus attachment follows the grooves, guiding you through the different patterns and designs on the template. Achieve proficiency doing perfect, repeatable patterns with very little practice! Combine and repeat patterns in interesting ways to create unique designs on your quilt! 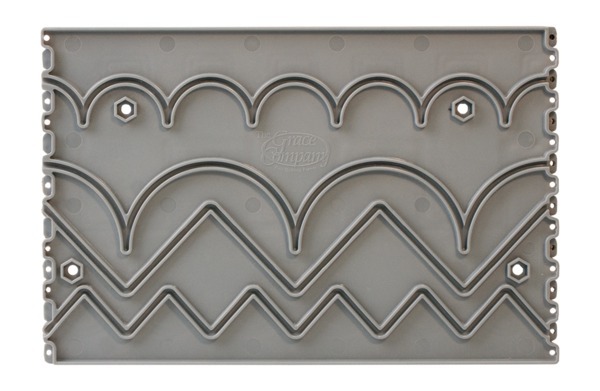 For perfect patterns every time, use the Plastic Pattern Perfect! 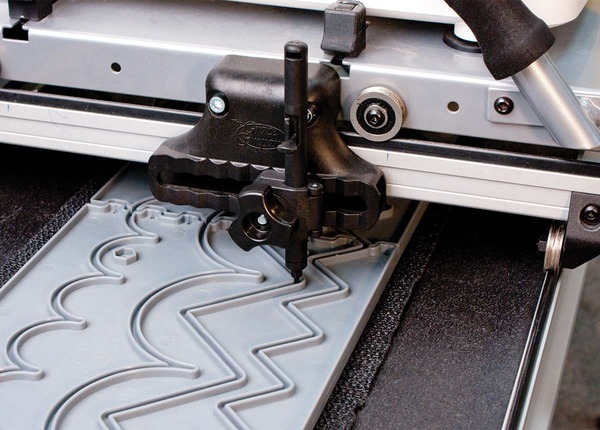 The stylus attaches right to your carriage and then guides your machine through the pattern templates as you move the carriage. Each basic set template is double-sided and has eight patterns. The Basic Plastic Pattern Perfect Set comes with the stylus and all hardware needed to use the Basic Set or Additional templates. Added Stability: Non skid mat prevents unintentional shifting of templates on the table surface. The Basic Plastic Pattern Perfect Set comes with the stylus and all hardware needed to use the Basic Set or Additional templates. Easy to use: Easy to follow panels guide your carriage almost effortlessly through one of eight patterns, for a perfect patterns the first time and each time you use it. Unique Design: Discover a wide variety of combinable and repeatable patterns with these new unique designs! Everything you need: All materials and hardware are included for you in a light-weight toteable package! The Plastic Pattern Perfect Basic Set comes with everything you need to get started quilting amazing pantographs. An included stylus kit attaches to the carriage of your quilting frame. 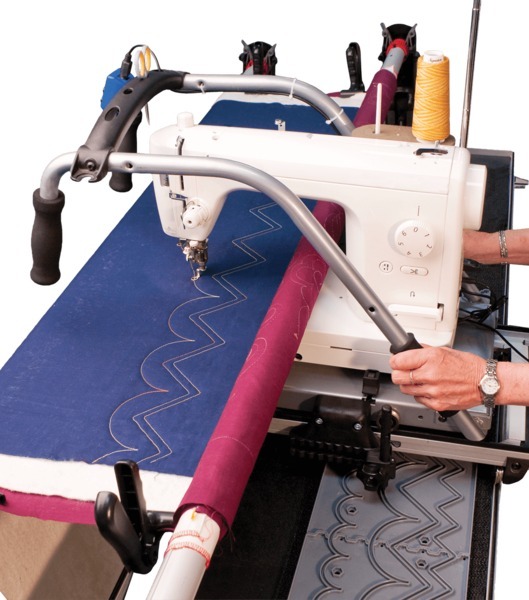 The easy-to-follow panels guide your quilting machine almost effortlessly through the patterns as you push the machine. The Stylus can be adjusted back and forth in ½ inch increments for easy pantograph off-setting. 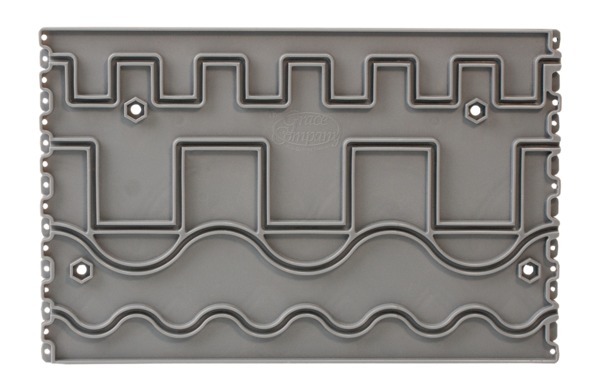 The Plastic Pattern Perfect Basic Set comes with 10 interlocking template panels. Each panel has a total of 8 patterns, 4 on each side. The panels can be mixed and matched front-to-back to make new and unique patterns and pantographs. Connect the panels in a variety of ways to create new pattern combinations. Product presentation, selection and price were the same on all of the other websites. I have dealt with your company before and was very satisfied with my experiences. That is what made the difference. Once again, awesome service all the way around! It is really easy to order from Allbrands. All products are of top quality and reliable. This is my 1st stop when buying sewing and quilting supplies and equipment.